My development PC suddenly started to behave strangely when running development ASP.NET sites from within Visual Studio 2008. Everything had been working fine for months but suddenly I got this error: "Unable to launch the asp.net development server because port xxxxx is in use" - where xxxxx was the random port used by Visual Studio. I managed to fix this issue by changing settings in my Anti-Virus software (ESET NOD32). Under the Setup menu I selected Advanced Setup. 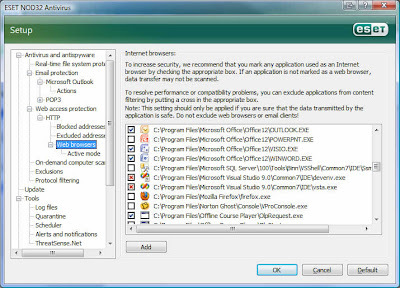 I then navigated to the Web access protection area of the configuration and selected Web browsers. Once in this area I then excluded both Visual Studio 9.0 executables. When I returned to Visual Studio and hit F5 or selected View in Browser - everything worked as before. Not sure why this started happening but I'm glad it's fixed!